Research in Motion (RIM) as the manufacturer of BlackBerry BlackBerry has been showing a prototype 10 Dev Alpha. On a mobile phone is still a prototype is no longer a regular physical keyboard on the BlackBerry mobile phones. Instead, RIM uses a virtual keyboard comes with a word prediction feature. As reported by Mashable, Thorsten Heins RIM CEO says BlackBerry will begin to focus using the virtual keyboard, with no abandon the use of a physical keyboard that had been there on BlackBerry phones. In his speech, he also mentioned that the BlackBerry OS 10 has the ability to display a virtual keyboard. The virtual keys are specially designed for BlackBerry devices 10. This virtual keyboard has a better prediction software, both for word formation and sentence formation. 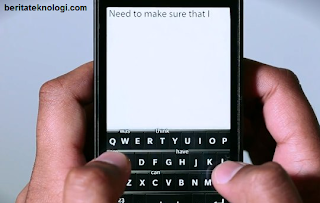 "When typing, the BlackBerry device 10 will predict the next word or sentence to be typed. To select a word in question, the user can immediately undergo a swipe," Heins said. Heins hopes the presence of these new features will provide the innovation on the BlackBerry device and might be adapted in the BlackBerry device that has a physical keyboard.